A little more than a decade ago, an undersized, often-overlooked second baseman climbed the ranks through the minor leagues and made his debut in Boston, peppering line drives off the Green Monster in Fenway Park’s left field while capturing the hearts of Red Sox fans with his aggressive and well-rounded style of play. After 10 years of Dustin Pedroia, watching Mookie Betts burst onto the scene over the last two years must be like déjà vu in Boston. In the early stages of his career, Betts has put the ball in the air a bit more often, and thus hit for a bit more power. Pedroia’s struck out less and gotten on base slightly more. But these differences are minuscule; both have an elite control of the strike zone due to their ability to make a ton of contact while possessing the eye to draw a good number of walks. And the most striking similarity is that both inflict massive damage to the pull field. Last year, Betts was one of the five best pull hitters in the game, his name appearing alongside four of baseball’s best power hitters in overall pull production despite his 5-foot-9 frame. His power output to the pull side, admittedly aided somewhat by the Green Monster, exceeded that of Josh Donaldson’s. Pedroia, meanwhile, has been among baseball’s most consistent pull threats for a decade. Red Sox hitting coach Chili Davis is quick to point out, though, that while both do the brunt of their damage to the pull side, neither hitter goes to the plate with a pull-field approach. Both stand shorter than 5-foot-10, both do the majority of their damage to the pull field, both do so thanks to their ability to turn on the pitch middle-in. Yet, even with all those similarities, both players agree that up until the point of contact, there’s very few similarities in how they get there. Let’s look at a couple home run swings to the pull field. Betts made it easy, by hitting one in his very first game of 2016. For Pedroia, we’ll go back to 2015. A defining characteristic of Pedroia’s swing is his unusually long stride. Pedroia’s power is generated from his lower half, where his long stride allows him to drop the back shoulder and generate a bat path that can create loft, which might otherwise be difficult for a player of his height. If the defining characteristic of Pedroia’s swing is the stride, for Betts, it’s the hands. Pedroia described them as “lightning-quick.” Both he and Davis mentioned the exceptional rhythm in Betts’ swing, between his hands and his lower body. The violence found in Pedroia’s swing is fluidity in Betts’. And Pedroia’s assumption is precisely what’s on Betts’ mind. The scouting report on Pedroia has been common knowledge for years — “they want me to hit singles to right, not doubles to left,” he said — and so it’s no surprise that more than 60% of the pitches Pedroia saw last season came on the outer-half, one of the 20 highest rates in baseball by a qualified hitter. The league was quick to adjust to Betts, too. 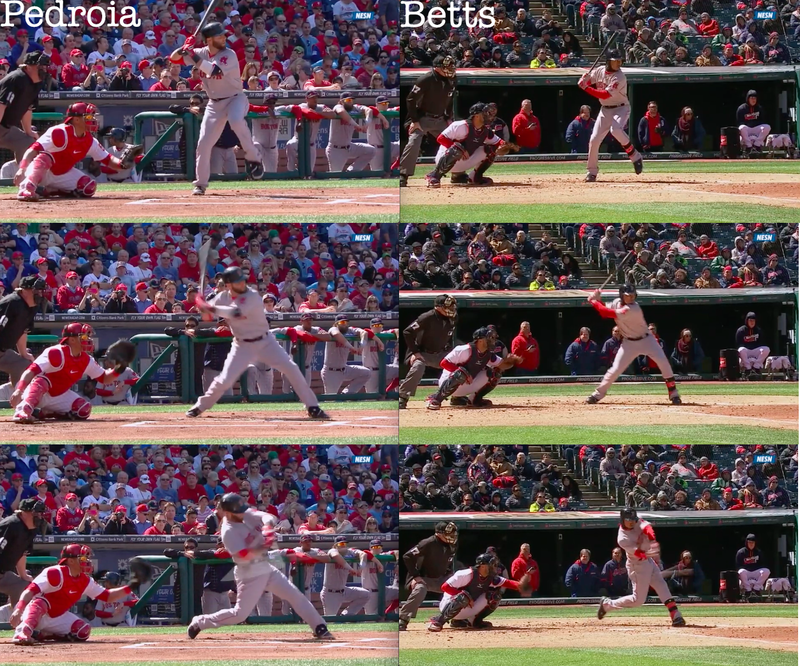 In fact, his rate of outer-half pitches seen was identical to Pedroia’s. So they’re already “pitching him away all the time,” as Pedroia envisioned might happen in the future, and Betts is already focused on making the adjustment. Betts admitted that, at his current size, he probably isn’t going to be hitting opposite-field homers. He’s starting with an advantage in size over Pedroia, though, and with added strength, all parties feel confident that Betts could one day develop power to all fields. The Red Sox have been fortunate enough to have one Dustin Pedroia all these years, and now they’ve got another one. The scary part is, the new one is just 23, and he’s only getting better. We hoped you liked reading Mookie Betts Is Dustin Pedroia All Over Again by August Fagerstrom!